Hi, can anyone advise. I have been diagnosed with SIBO (small intestinal bacterial overgrowth) which is giving me severe bloating problems. I have not seen any mention of this in the Clever Guts book although apparently it is a very common gastro problem which I thought might have been addressed. I would like to know if the Remove and Repair section of the reboot would help resolve the SIBO issues. Any ideas gratefully received. I would have emailed Michael directly for an answer but didn’t see anywhere where I could do this. What medical treatment or dietary changes has the diagnosing doctor recommended? AFAIK the only proven medical treatments to substantially reduce the bacteria in the small intestine are prescription antibiotics or prescribed meal replacements (rests the gut and starves the microbes). Both treatments need medical supervision and both will also impact the bacteria in the large intestine. After the course of treatment is complete you may well be able to work within the guidelines of Clever Guts in order to continue to allow your gut lining to recover, and encourage a normal/ healthy microbiome to flourish. 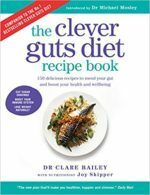 Clever Guts is fundamentally a properly balanced, very varied, anti inflammatory wholefood diet. If at all possible do this with support from the diagnosing doctor, a gastroenterologist or registered dietician (p.187). This is even more importamt if you have other medical conditions linked to the SIBO.